Crepes are a great way to create a simple side or main dish, using savory ingredients. They are a also a good way to use use leftovers in a creative way. Do you have any leftover ham or or chicken from your your Easter Dinner? 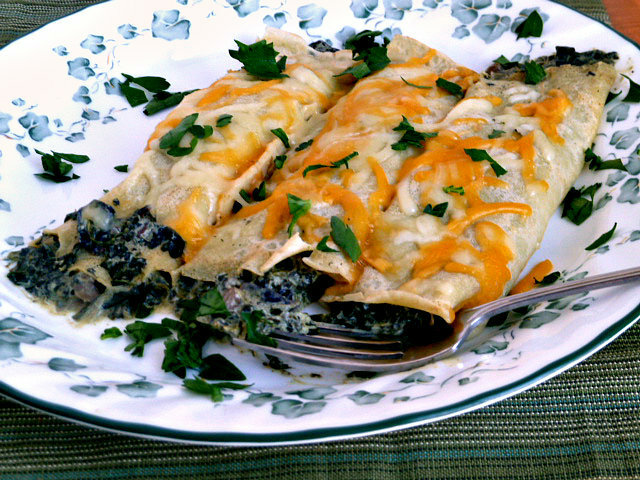 You could add leftover cooked meat to the Creamy Spinach and Mushroom crepes for a light appetizer, lunch or dinner. There are so many possibilities. After a week of eating all the Easter goodies, a lighter fare is a welcome addition to many menus. 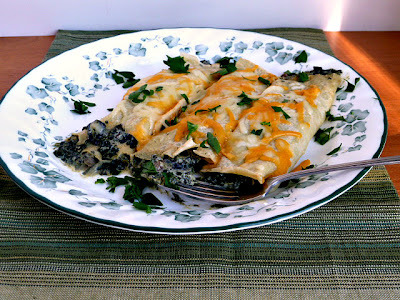 I saw these delicious crepes on my friend Kim's blog, Liv Life, awhile ago. They had my name on them. Crepes were all the rage, back in the day, and then they went away. It seems like they are coming back now. Crepes are pretty easy to make, once you get the hang of it. Crepes are very thin pancakes. Just like making pancakes, the first couple that you make are rejects. You don't need a special pan. I just used a an "8 frying pan and Alton Brown's Crepe recipe here. You can make the batter in a blender or use an immersion , "stick", blender. One important thing that you have to do with crepe batter is to let it "rest" anywhere form at least one hour to overnight. Letting the batter rest keeps the crepes from tearing in the cooking process. I didn't have any torn crepes. You can make the crepes ahead of time, and after they cool, freeze them between layers of wax paper in a freezer container or bag. 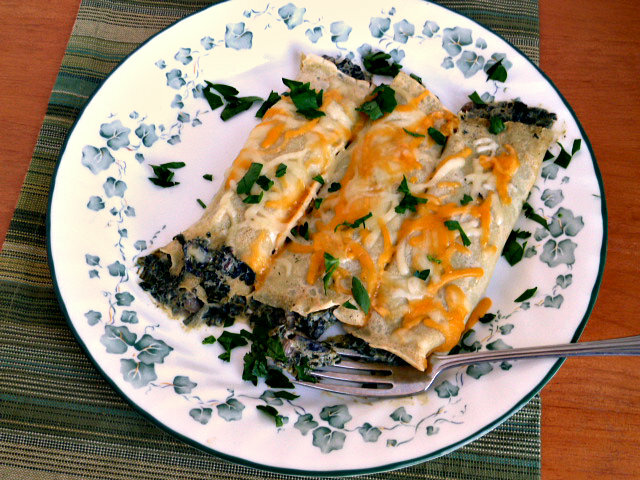 The Creamy Spinach and Mushroom crepes are chopped spinach, sauteed white mushrooms and onions, in a sauce made with white wine, low sodium low fat chicken stock, herbs, and sour cream, but I used Greek yogurt all wrapped up in a savory crepe. I did add a little cheese on top of the crepes for color, and added flavor. These crepes were a light lunch, and tasted so good, with so much flavor the herbs, and sauteed mushrooms and onions. You should really give these a try. Enjoy! 1 10 oz pkg. frozen, chopped spinach, thawed, drained, and squeezed dry. Melt butter in a large nonstick skillet over medium-high heat. Add onion and garlic; sauté 2 minutes or until onion begins to brown. Add mushrooms, salt, and pepper; cook 3 minutes or until liquid evaporates and mushrooms are tender, stirring frequently. Add wine, and cook 3 minutes or until liquid almost evaporates, stirring frequently. Stir in thawed, chopped spinach, until combined and heated through. Add broth and fresh thyme or Herbes de Provence; cook 2 minutes. Remove from heat; add sour cream or Greek yogurt, stirring until well blended. Spoon about 1/3 cup mushroom mixture into center of each crepe and roll up. Place crepes, seam side down in a 13 x 9 pan, sprayed with cooking spray. Sprinkle tops with shredded cheese. Broil 2 minutes until lightly browned. These crepes are good, and creamy, too. LOVE the spinach and mushroom! That would totally guarantee that I won't have to share with the kids! ;) The cheese on top is brilliant and puts a perfect finish on the dish. Great job Becky... one of these days I'm really coming over for dinner! Beautiful job! These sound sooo incredibly delicious, can't wait to try! These crepes are very flavorful, and healthy too. Spinach and Mushrooms are a great combo!